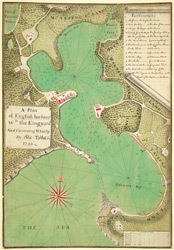 A plan of English Harbour on the island of Antigua, drawn in 1750 by Colonel Sherrington Talbot using military drawing techniques. English Harbour was strategically placed at the eastern end of the south side of Antigua. It was almost landlocked and well protected against both bad weather and attack by the mountains and nearby forts, providing an unusually safe place for ships to be loaded and repaired. Its main weakness was its small size, but after an expansion of the number of buildings in the dockyard, it was used as a base by the Royal Navy. English Harbour was eventually closed in 1889.